Photo from 2012 by Sean Go in the Torontoist Flickr pool. When it comes to transit planning, we can’t ignore the elephant in the room: the TTC. It’s time to pull rank, Toronto. Let’s talk about scale. Recently, I went to a Metrolinx public consultation (one of several they’ve been hosting) on their draft regional transportation plan for 2041. Metrolinx, as part of the provincial Ministry of Transportation, has taken responsibility for regional transit planning. Originally, its mandate was for transit to and around the City of Toronto. It has since expanded to cover the GTHA, it “partners” with other transit systems, and, as the operator of PRESTO, it is involved in Ottawa transit as well. Increasingly, Metrolinx serves as a branding vehicle for provincial investment in any transit system. The public consultation meeting was very well done, with real opportunity to comment on a variety of aspects of the plan. One of the things I noticed about the plan was that its description of expected population growth in the GTHA was expressed in percentages. That’s not an especially weird way to express population growth, but in the absence of accompanying current population figures, it can leave a distorted picture of the region. As you can see in Metrolinx’s map, Toronto’s population is expected to grow by a smaller percentage than the surrounding municipalities. However, Toronto’s population is so much higher to begin with that in actual numbers, Toronto is going to gain more people than any of its neighbours, with the possible exception of York Region, an area over seven times the size of Toronto. That’s not obvious from the map. Similarly, Metrolinx has done a calculation of projected peak-period trips, which could be taken using any mode of transportation. 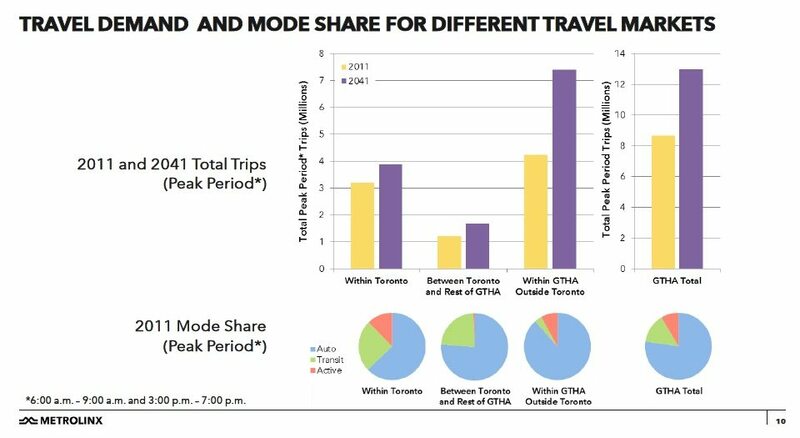 In the smaller pie charts below the bar charts, you can see that the demand on public transit as a share of travel is expected to be quite different for Toronto and its neighbours. But the bar chart leaves the impression that the need for investment in public transit is much greater in the surrounding region. But it’s a more complicated picture than it appears. Given that Metrolinx’s plan is one for public transportation, these charts and the impressions they leave matter. What is not visible from these charts and from Metrolinx’s approach generally is the huge difference in scale of transit systems in the region. GO Transit, operated by Metrolinx, covers a geographically bigger area than the TTC. But the TTC is a much, much bigger system. The differences of scale—of distance and of ridership—are not emphasized in Metrolinx’s planning. Let’s do some comparisons. Ridership is expected to fall a little bit for 2017—due in part, no doubt, to overcrowding and the many closures for repair—but in 2016, the TTC carried more than 538 million riders, which includes 3,881,094 Wheel-Trans trips. On multiple days in 2016, the TTC carried over 1.8 million riders. The TTC (more statistics at this link) runs three subway lines, 157 bus and streetcar routes, and the Scarborough RT. These collectively serve 10,147 stops, 812 of which are bus stops outside Toronto city limits. These vehicles cover 6807.2 kilometres of bus routes, 338 kilometres of streetcar routes, and 68.3 kilometres of subway and RT rails, with another 17.4 kilometres coming online with the Spadina Line extension in a few weeks. To do this takes 1,926 buses, 249 streetcars, and 868 subway cars. In 2016, it all totalled 238,220,000 kilometres operated. The TTC employs 14,179 people. About 10,000 of them are members of the Amalgamated Transit Union Local 113, which has represented TTC workers since 1899. There are a further 500 electrical and tech workers, represented by CUPE local 2, and about 50 special constables. The operating budget for the TTC in 2016 was about $1.95 billion, which includes Wheel-Trans. That’s $3.62 per ride. That’s nothing short of amazing. GO Transit ridership in 2015 was 70.8 million. Its operating budget for 2015/16 was $813.7 million. That’s about $11.50 per ride. Every other system collectively carries 227.85 million riders annually. Assuming a few of the above figures are underestimates, let’s round it up to 230 million passengers. 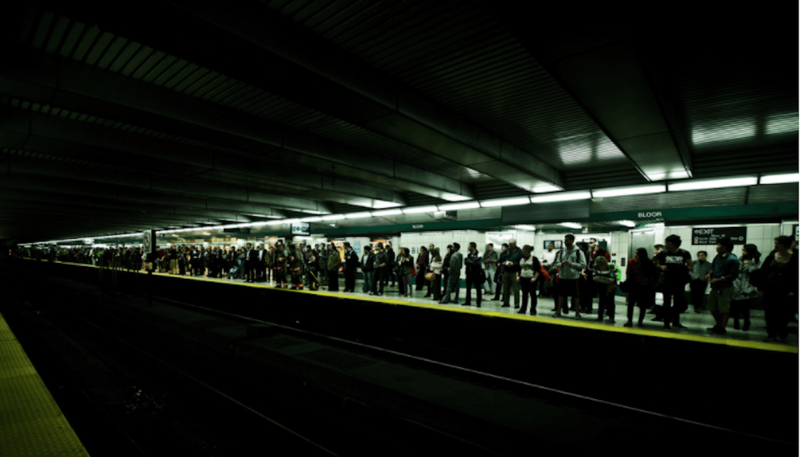 The TTC carries more than twice as many riders as the rest of southern Ontario put together. It carries more every month than every other system does in a year, except GO Transit. To carry GO Transit’s annual ridership, the TTC needs less than two months. Who does the biggest job? Who makes the biggest contribution to mobility? Who should lead transit-planning conversations? Toronto, Toronto, Toronto. It’s not even close. The complexity, the number of employees, the operating hours, and the ridership of the TTC are all in another league. I’m not suggesting that the TTC should plan regional transit in Ontario. But any transit planning in southern Ontario should clearly reflect the different scales of population and transit system ridership. The failure to put this difference front and centre, and the failure to follow it with appropriate funding, is a distortion of transit needs in the region. Equally important, it’s long past time the scale of Toronto’s public transit was matched with an appropriate governance model. Transit coming in and out of Toronto should be coordinated with the TTC, through a governing body on which the City and the TTC have a dominant voice. In Appendix 4, toward the end of the Metrolinx draft plan (page 212), is a brief consideration of governance models—something I don’t remember being mentioned at the consultation. There are three ideas floated (from a 2014 Toronto Board of Trade discussion paper): “an enhanced status quo”; a provincial agency that is an “amalgamation of GO Transit, TTC and other local transit authorities under an expanded Metrolinx or other provincial ministry, department or agency”; or a municipal body that amalgamates the same under a board including regional chairs and the mayors of Hamilton and Toronto. In the amalgamation models, the TTC is one of “ the local transit authorities;” you would never guess from those sentences that GO Transit is a much smaller agency. I’m a suspicious sort, it’s true, but these models read to me like a political effort to water down the TTC’s and Toronto’s importance in the region and its economy. The TTC is bigger than all the other transit systems put together. I’m not generally a Toronto-is-the-centre-of-the-universe kind of thinker, but regional transit planning that doesn’t recognize Toronto’s dominance is a distortion. I don’t see how that could serve Toronto and the GTHA fairly or well.